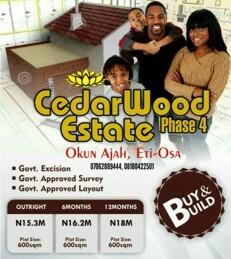 Home / Properties / OWN A PLOT FOR AS LOW AS 15,000NAIRA, HURRY NOW! OWN A PLOT FOR AS LOW AS 15,000NAIRA, HURRY NOW! "WORKER'S SUPER SALES LAND PROMO"
Exclusively for workers, Salary earners and last but not the least anybody. 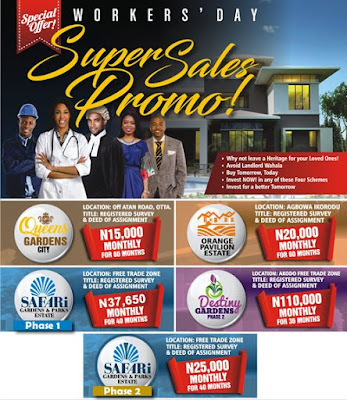 Workers Super Sale Promo gives all Nigerian Salary Earners unique opportunities to own lands with CONVENIENCE in choice locations, paying bit-by-bit (N15K, N20K, or N25K) for longer periods— 40months to 60months. WORKERS/SALARY EARNERS SUPER SALES (LAND) PROMO !!! 1. SAFARI GARDENS and PARK ESTATE 2(Free trade zone axis, Ibeju Lekki, Lagos)— N25,000 monthly for 40 months. Outright Payment is N900,000. 2. ORANGE PAVILION ESTATE (Ikorodu)— N20,000 Monthly for 60 months.Outright Payment is N1,020,000. 3. QUEEN GARDENS CITY (Ota, Ogun State)— N15,000 Monthly for 60 months. Outright Payment is N765,000. 4. DESTINY GARDENS 2 (Akodo Free Trade Zone Axis, Ibeju Lekki, Lagos)— N110,000 monthly for 36 months. Outright Payment is N4,800,000. the best gift you can give yourself, and your family is a gift of land and property.